President Dae-chun Jun, second person from the left, is listening to explanation about manufacturing procedure from the lead engineer of Dong-a Flexible Metal Tube Co., Ltd.
Dae-chun Jun, President of Korea Gas Safety Corporation, visited Eastern Gyeonggi branch and Dong-a Flexible Metal Tube Co., Ltd located in Yong-in city on the 27th of April as a part of management by wandering around and checked the actual conditions of gas safety site. After President Jun met the spot staffs who are making their utmost efforts at the forefront of gas safety in the Eastern Gyeonggi branch, he listened to various opinions for smooth communications not only between headquarters and branches but also between corporation and customers and he requested to do their best in order to minimize the gas accidents. 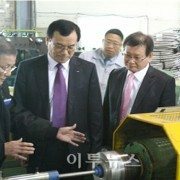 In addition, he visited Dong-a Flexible Metal Tube Co., Ltd and checked the manufacturing procedures. He emphasized not to make a mistake during manufacturing procedure of gas products in order to keep people’s happiness and he listened to difficulties of work site.